Sent you an email steve. Thanks man - pinged you back. Prior Steve, we were with a well-known SEO agency who couldn't deliver near the quality that Steve and his team do. He also provides good feedback on content creation and has achieved links from our competitors. Hi Steve, I dropped you a PM a few days ago but haven't heard back. Are you still taking on new clients or have you closed your books for now. Let me know when you have a minute. Hey Louey - sincere apologies - Since we just had the bad news, I'll blame waiting for England to do the inevitable in the World Cup for distracting me from jumping on BuSo this week. I'll reply right away as we're about to have a small price increase and want to make sure you can get in before that if you wish. Don't worry - all our previous small price adjustments have protected existing campaigns for at least a year. All the more reason for anyone on the fence/thinking about ordering in the next month or two to jump on early! Just wanted to give a quick review of how my main site is doing with Steve's links. This site launched in Sept '17 and had its first links dropped at the end of Nov ' 17 - early Dec '17. Steve's links are the ONLY links pointed to this site. 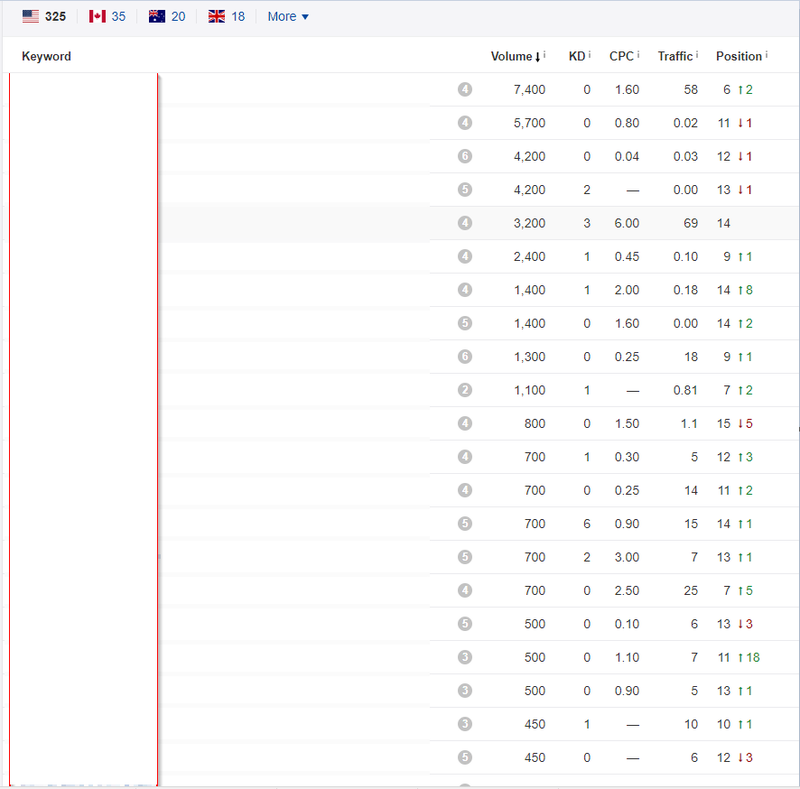 This screenshot is just a cross section of the overall keyword makeup of the site. The site is currently ranking for about 8,000 different keywords. This is about the best result I can expect in regards to ranking performance for a brand new site on a fresh, unaged domain, using 100% whitehat techniques, and only about 6-7 months worth of links. I believe the site has crossed it's first "authority threshold" and is now able to front-page for actual money terms. My guess is that, within 3-4 months, we will dominate a specific category within my vertical that I'm currently targetting at the moment. Bottom line - ReachCreator, Steve, and Garrett are the real deal! How many links did you get? Thanks @stackcash great to hear your sites are doing well! How many links we order is kind of irrelevant because different competition levels and different verticals call for different numbers of links. But, we're having Steve and his team build about 10-15 links for us each month. I haven't really done much public speaking about linkbuilding so this will be a rare chance to catch me speak. I doubt I'll speak more than once next year... if that... and this event is even free so double the win! I'll be up there with one or two colleagues, the night before, so will have time to have a meet up with any BuSoers who are about that night and possibly the next depending if we host anything in the evening of the event (which we may) so the afternoon/night before will be the best for hanging out. For those of you out of town - Hilton has a summer sale at the moment (if you sign up for Hilton Honors - free) and the Double Tree is a great deal accordingly! Boring Niches Are Easy: Linkbuilding For Any Site Unmasked! I expect I'll be around the odd day either side of both of those to hang out as well as during the events if anyone is going. Hopefully meet some of you all IRL soon! Content quality is wow. Sites are legit. Have re-ordered and will be part of my monthly SOP. Thanks for the review - much appreciated. Just a heads up that we're doing something really cool in the linkbait space - the kind of thing that will let you pretend to be the client of a big agency with one of those fancy things they brag about at conferences. It's due to launch in about a month's time. Post 'send me more info' in the thread here if you'd like a DM with the details. Initial private DM pricing will be the lower than it's ever advertised/sold at again after the proper launch only to people posting in this thread. Wow what a mega response - thanks everyone! You should all have the info on the launch package by DM now or on Skype if we discussed it there first. Anyone else interested we're doing one final round of invites next week (probably on Monday) then pre-launch will be closed and we'll start getting the initial orders fulfilled and preparing for the full price launch in October. As a little teaser anyone who takes up the pre launch will get guaranteed/locked in pricing for 12 months or 10 orders whichever comes first. So if it's something you might need a few of/think would be awesome for your agency clients/reselling at a mark up jump on now! Hi Steve, that sounds like an interesting service and one month could be good timing with my personal cash flow. Please send me more info. Thanks. Send me more info if it's different from the previous linkbait offering. I'm intrigued, can you send me more info please. I would also like more information via DM once this is made available please. Interested, please send me more info, Steve. Pls send info on linkbait offer. Count me in as well. Thanks. Hey all sincere apologies for the delay in replying. I was away in the US for meetings and a conference and got sick while I was away which combined with the manic schedule, some terrible flights, and a web host that apparently hates me... left me a bit shell shocked. I'm back and caught up now on all messages. If I've missed any of you by DM or on Skype please do prod me again as I likely haven't seen it if I haven't replied. The pre launch is now closed so please no more posts in the thread. Look out for full details on the new product when it launches in a few weeks after we clear all the pre launch orders (likely will take a few weeks!). As always I'm available by email steve at verticem.com for any of your questions or by DM here. DM here only for wait list (in case anyone drops out of the pre launch etc). Hey all - just wanted to post a quick update. We're still going strong with our core 'just outreach' product with many BuSoers still happily on board (that's where we just build links to your blog posts/content etc with your BuSo discount - the main product advertised here). But we've had a breakout success with some of our new animated linkbait and egobait stuff during a fairly quiet 'soft launch' with some agencies putting in some pretty crazy orders last month (40 etc) which is why we've been quiet about pushing those on here until now giving us a chance to catch up and staff up to take the work. I've updated the main post in this thread with the basics and you can DM/email/skype for full details at any time. We're all scaled up and ready to take orders on those now. The egobait is going to be pretty exclusive as it'll get crowded fast if we overdo it so we're only looking at taking on 3-4 per month from here so if you're interested in finding out more give me a shout sooner rather than later! Please pm me all your link building services and prices. Hey - thanks for the message - I've replied to all my Skypes so hopefully you were one of them! If not just ping me an email over to steve@verticem and I'll pick up ASAP - on vacation till Wed but will be on/off throughout to pick up messages.